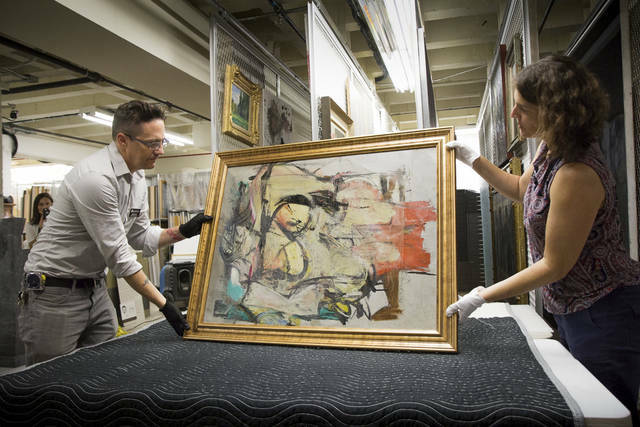 PHOENIX (AP) — More than 30 years after it was brazenly stolen from an Arizona museum, a painting by Willem de Kooning reportedly worth $100 million is going back in the public eye where it all began. CHIPINGE, Zimbabwe (AP) — Mozambique on Wednesday began three days of national mourning for more than 200 victims of Cyclone Idai, while the death toll rose over 100 in neighboring Zimbabwe from one of the most destructive storms to strike southern Africa in decades. Torrential rains are expected to continue into Thursday and floodwaters are still rising, according to aid groups trying to get food, shelter and clothing to desperate survivors. It will be days before Mozambique’s inundated plains drain toward the Indian Ocean. People have been reported clinging to rooftops and trees since the cyclone roared in over the weekend. The United Nations humanitarian office said the town of Buzi, with about 200,000 people, was at risk of becoming at least partially submerged. Zimbabwean President Emmerson Mnangagwa received a somber welcome in the hard-hit mountain community of Chimanimani near the border with Mozambique. Zimbabwean officials have said about 350 people may have died. Some bodies from Zimbabwe have been swept down the mountainside into Mozambique. “Some of the peasants in Mozambique were calling some of our people to say, ‘We see bodies, we believe those bodies are coming from Zimbabwe,’” said July Moyo, the minister of local government. Mozambique’s President Filipe Nyusi said late Tuesday that more than 200 people were confirmed dead there. After flying over the affected region on Monday, he said he expected more than 1,000 deaths. Aid workers were shocked as they arrived in the Mozambique port city of Beira, estimated to be 90 percent destroyed. The 500,000 residents of the city, which has some neighborhoods that are below sea level, are scrambling for food, fuel and medicine. “The power of the cyclone is visible everywhere with shipping containers moved like little Lego blocks,” said Marc Nosbach, Mozambique director for the aid group CARE. International aid has started trickling in. The United Arab Emirates will provide 18.3 million dirhams ($4.9 million) to Mozambique, Zimbabwe and Malawi, the Emirates News Agency reported, citing the Emirates Red Crescent. Zimbabwe’s president said a planeload of aid from the UAE was expected to arrive in the capital, Harare, later Wednesday. The chairman of the African Union Commission said it would provide $350,000 in immediate support to the countries. The European Union has released 3.5 million euros ($3.9 million) in emergency aid, and Britain pledged up to 6 million pounds ($7.9 million). Tanzania’s military has sent 238 tons of food and medicine, and three Indian naval ships have been diverted to Beira to help with evacuations and other efforts. Hunger and illness are growing concerns, with crops destroyed and waterborne diseases likely to spread. Associated Press writers Andrew Meldrum and Cara Anna in Johannesburg and Matt Sedensky in New York contributed. Disclosure statement: Jennifer Fitchett receives funding from the DST-NRF Centre of Excellence for Palaeoscience. Partners: University of the Witwatersrand provides support as a hosting partner of The Conversation AFRICA. Disclosure statement: John F. May does not work for, consult, own shares in or receive funding from any company or organization that would benefit from this article, and has disclosed no relevant affiliations beyond their academic appointment. The average woman in Niger has over seven children – nearly triple the average across developing countries. While fertility levels have declined rapidly in most parts of the world, many countries in the sub-Saharan African region of the Sahel have seen their reproductive rates go down very slowly, and only very slightly. The average woman in Niger, for example, still has 7.2 children, according to the Population Reference Bureau 2018 World Population Data Sheet. The average in developing countries is 2.6 children per woman. With an annual growth rate of 3.8 percent, the world’s highest, Niger could see its population of 22.2 million nearly triple, to 63.1 million, by 2050. Half of all Nigeriens are under the age of 15 – a higher proportion than any other country. Neighboring Nigeria and Mali have a youthful age structure similar to Niger’s. As a demographer, I am concerned by the situation in the Sahel region. I have studied sub-Saharan Africa’s population growth for decades, both at the World Bank and as an academic, and I have learned that a surplus of young people can predict social unrest. In theory, a young population should drive economic growth. It can be a competitive advantage against Western countries that – like the United States, United Kingdom, France and Italy – have rapidly aging populations. Only 19 percent of the U.S. population is under 15. But poor countries like those in Africa’s Sahel region are struggling to provide many young people with education, health care and, critically, jobs. The Sahel, a sub-Saharan region of Africa. Niger is a peaceful and politically stable nation. Yet, despite robust economic growth since 2000, it remains very poor. Just under half of Niger’s booming population earns less than US $1.90 a day, and unemployment is very high. Incomes in oil producer Nigeria are significantly higher – about $5,700 per person. But wealth is unevenly distributed, and about half of Nigeria’s population lives on less than $1.90 a day. The countries of the Sahel are mostly rural. But, with so many young people, there are not enough agricultural jobs to go around. Many rural youth end up moving to cities looking for work – and find unemployment, instead. Studies conducted in a number of Middle Eastern countries suggest that a very young age structure coupled with a lack of economic opportunity can be an explosive combination. That’s why a surging population is a red flag for scholars of a new field called “demographic security.” Baby booms can increase a country’s risk of civil unrest, conflict – and, in extreme cases, these booms can even foment extremism. The risk of youthful revolt is highest when elected leaders are unresponsive – even repressive or predatory – in the face of a frustrated and struggling population. Those were the ingredients for the 2010 revolt in Tunisia that sparked the first Arab Spring uprising. In the most extreme cases, terrorism can take root after conflict erupts. Discontent makes people more susceptible to extremist ideologies, while poverty helps terrorist groups enlist new recruits often by offering small monetary incentives. Political upheaval makes it easier for terrorist groups to infiltrate a country’s borders. According to Serge Michailof in his book “Africanistan: Development or Jihad,” this is effectively how the Taliban took over Afghanistan after a Soviet occupation in the 1980s left the country leaderless and divided. Now, I fear the same thing is happening in the Sahel. A decade ago, this region of West Africa was a generally stable place. Nigeria, Mali and Niger all had secure borders, no civil conflict to speak of and absolutely no terrorism. Today, Nigeria and Mali are rife with terrorist threats. Boko Haram, which was founded in Nigeria in 2002 to “purify Islam in northern Nigeria,” has killed hundreds, perhaps thousands, of soldiers and civilians across the Sahel, abducted schoolgirls and executed lethal suicide attacks using women and children as human bombs. As al-Qaida loses ground in the Middle East, it, too, has began to spread into Africa. The terrorist organization has an estimated several thousand fighters in North Africa and the Sahel, who have sometimes joined forces with Boko Haram. Islamic State affiliates are also operating in West Africa. Nigerien Interior Minister Mohamed Bazoum at a refugee camp in Diffa, Niger, in 2016 following attacks by Boko Haram. Some of these groups have now penetrated once-peaceful Niger, infiltrating its borders from neighboring Nigeria and Mali. Refugees from those countries fleeing Boko Haram have also settled in refugee camps on Niger’s borders. Niger faces an “existential threat” from militants, according to Minister of Defense Kalla Mountari, who spoke with Voice of America in late 2018. The U.S. military has 800 troops stationed in Niger , where they provide counterterrorism training to local troops. It is the second-largest U.S. military deployment in sub-Saharan Africa, after Djibouti. A youth bulge in a developing country with high unemployment does not automatically lead to terrorism. Togo and Tanzania, for example, are low-income countries with high birth rates but relatively low levels of conflict. What makes Niger and Mali different, in my assessment, is that their populations are growing much faster – faster than virtually anywhere else on Earth. The challenges their governments face in providing for their people are thus much more acute. They are also located next to the vast expanse of the Sahara desert, where terrorist groups transport weapons and operate almost freely, according to the U.S. State Department. Nigerien soldiers at a British-led counterterrorism training in 2015. In Nigeria’s case, extreme inequality, widespread poverty and poor governance compound the problem of youthful discontent, allowing terrorists to set up shop. Gen. Michael V. Hayden, CIA director under President George W. Bush, foresaw today’s outbreak of terrorism in the Sahel. In a 2008 speech delivered at Kansas State University, Hayden cited rapid population growth in “countries least able to sustain it” – specifically Niger, Nigeria and Yemen – as an urgent global concern. In my experience, however, few leaders in the Sahel are prepared to grapple with the political difficulties of reining in population growth. Most sub-Saharan African countries do have family planning policies aimed at curbing fertility. But triggering a rapid and significant fertility decline is a daunting task. Attitudes about family size and birth control are deeply ingrained, less than 30 percent of women of reproductive age use a modern contraceptive method and abortion access is extremely limited. Creating real educational and employment opportunities for young people is an equally daunting challenge. Unless more is done to promote family planning and boost economic prospects in the Sahel’s fastest-growing countries, I fear terrorism is the likely result.